Come experience what everyone is talking about! Let us welcome your group tours aboard the Celebration Belle! Convenient on-site motorcoach parking is available. 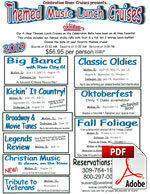 All Day Cruises, 4 Hour Themed Cruises (Big Band, Classic Oldies, Fall Foliage and more! 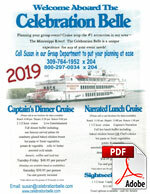 ), Captains Dinner Cruises, Special Events & Holiday Cruises to name just a few. 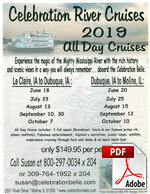 Cruise destinations including: Moline, IL (Quad Cities), Dubuque, IA, and North to Prairie du Chien, WI. The 770 passenger, Celebration Belle is fully ADA compliant and we have an elevator onboard. From the moment your group is greeted upon arrival, our entire crew provides exceptional service thru out. Reserved seating is arranged on our main dining decks. There are also 2 observation decks to sit and enjoy the views. Don’t forget your camera! Live Entertainment? Yes! We have the best of the best when it comes to entertainment! Depending on the cruise you choose will depend on the professional band we have onboard- your groups will love all of them. We do have a dance floor on each dining deck. 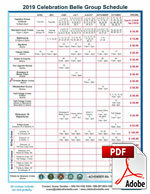 Need assistance with your tour planning? 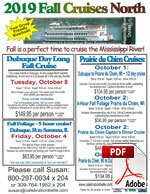 Make your tour planning an ease ~ call Susan for sample itineraries and reliable tour planning assistance. We package with motorcoach friendly hotels and attractions to provide you with your perfect tour! One call can have your tour set for “selling”. Celebration River Cruises are proud members in the following motorcoach organizations: National Tour Association, American Bus Association, Bank Travel, Heritage Clubs International, Iowa Group Travel, Eastern Iowa Tourism Association, Circle Wisconsin, Dubuque CVB, Quad Cities CVB and LeClaire Chamber of Commerce.